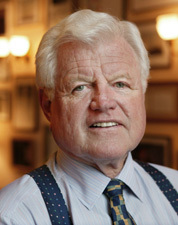 Eduardus Moore Kennedy, dictus Ted Kennedy (Bostoniae Massachusettae, 22 Februarii 1932; Hyannis Port Massachusettae, 25 Augusti 2009), natu minimus Rosae et Iosephi P. Kennedy filius et Roberti Kennedy ac praesidis Ioannis F. Kennedy frater, fuit senator Americanus et praecipuus dux Factionis Democraticae. Etiam filius eius Patricius I. Kennedy politicorum peritus est. A mense Maio 2008, Kennedy cerebri cancro laborabat. In equestrem dignitatem Britannicam anno 2009 receptus est. Novissima mutatio die 11 Aprilis 2017 hora 21:56 facta.